John Cena is an American television and movie actor, and a WWE professional wrestler. He has won a number of WWE championships and has appeared in numerous movies and television shows, in the latter of which he often portrays himself. John Cena is a descendant of Mayflower passengers Richard Warren and Edward Winslow. He has both royal and magna carta ancestry with descents from King Edward I and a number of Magna Carta sureties. Some of his U.S. Presidential kin include John Adams, John Quincy Adams, Millard Fillmore, Franklin Pierce, Abraham Lincoln, Ulysses S. Grant, William H. Taft, Calvin Coolidge, Franklin D. Roosevelt, and both Presidents Bush. 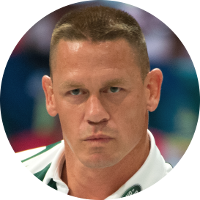 Fellow celebrities in John Cena’s family tree include Humphrey Bogart, Christopher Lloyd, Julia Child, Lucille Ball, Kevin Bacon, Kyra Sedwick, Meghan Markle, Orson Welles, Nelson Eddy, William H. Macy, Raquel Welch, and many others. Other notable kin are astronaut Alan Shepard, Walt Disney, evolutionist Charles Darwin, banker J. P. Morgan, Wizard of Oz author L. Frank Baum, poet and playwright Robert Frost, American Red Cross founder Clara Barton, poet Henry Wadsworth Longfellow, Boston Tea Party participant Amos Lincoln, and many more.